Xavier Elizondo Castro is the son of Diana and Ryan Castro. Xavier is a pre-kindergartener at Faulk Early Childhood. In his spare time, Xavier enjoys playing with his toys and his little sister Jasleen. His favorite color is blue. He likes school because its super fun and he gets to run outside. Xavier’s goal is to be a police officer when he grows up. Kai is a 3rd grade student at Kieberger Elementary and is the son of Tonya Chamberlain. After school, Kai does his homework as soon as he arrives home. Then for fun, he likes to play outside and sometimes he will throw the football around or paper airplanes. Kai’s favorite subjects in school are math and science. Kai loves science because Mr. Bamburg and Mrs. Robinson make it so much fun with all the labs and interesting things they do. Kai likes math because he enjoys working the problems and finding the answers. When he grows up, Kai would like to be a professional football player. Kai was selected as "Panther of the Month" because he works hard, is respectful, cooperative, and responsible. 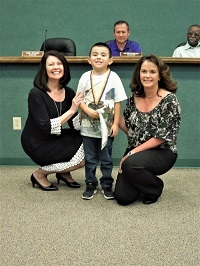 Kieberger Elementary is proud to have Kai Chamberlain as their Panther of the Month. Camryn is a fourth grader at CMES. She is the daughter of Tamika Clark, and the granddaughter of Margaret Clark. Camryn has one younger sister, and one younger brother. She currently has two dogs. Her favorite color is purple. Camryn's favorite hobby is dancing. Her favorite subject in school is math. Camryn likes school because she can learn new things everyday while spending time with her friends. Camryn hopes to become a teacher when she grows up. Camryn was selected as "Panther of the Month" because she is always smiling and very polite. She is very respectful and always puts others first. We are very proud of her hard work and dedication. Please join us in congratulating Camryn Nickles Clark. She is one of the many bright stars we have at Charlie Marshall Elementary. Elora is a 7th grade student at A. C. Blunt Middle School. She is the daughter of Kat and Shane Pierre. Elora has lived all her life in Aransas Pass with parents, her two brothers, and her dog, Muffin. Her favorite class at school is Math. When ask why that is her favorite class, she says she just loves it. When not at school, Elora loves to play any sports in her spare time. Her favorite sport is volleyball. She hopes to continue playing through high school and college. When she finishes school, she wants to become a chiropractor or a nurse because she enjoys helping others. Elora is a very dedicated student. People would be surprised if they knew she has already set goals for herself and is working hard to achieve them. 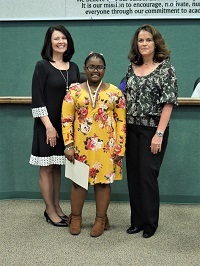 Elora Pierre was selected as “Panther of the Month” because she is a shining example for other students. She was nominated by her teachers because she always follows the rules, makes good choices, and works hard to be successful. 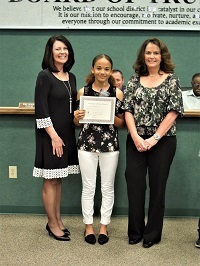 A.C. Blunt Middle School is proud to have Elora Pierre as their Panther of the Month. Deacon is a sophomore at Aransas Pass High School and is the son of Philip and Sarah Arrington. Deacon has a brother, William and a sister, Raynie. In his spare time, Deacon enjoys helping others, taking care of animals, and playing sports. Deacon’s favorite subject in school are math, history, science, and English and he loves to study new things so as to further his knowledge in many fields. 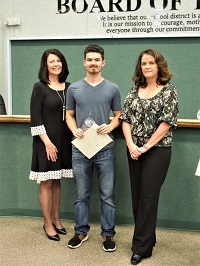 Deacon was selected as Panther of the month at Aransas Pass High School because he is kind and hardworking. He is incredibly studious, and is a good example to his peers. Aransas Pass High School is proud to have Deacon Arrington as their Panther of the Month.